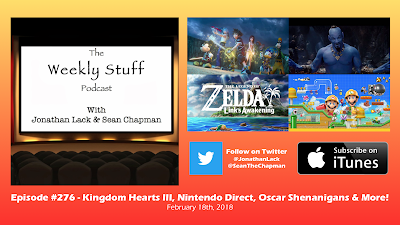 It’s time for a bonus episode of The Weekly Stuff Podcast with Jonathan Lack & Sean Chapman, a weekly audio show that explores the worlds of film, television, and video games. You can subscribe for free in iTunes by following this link. 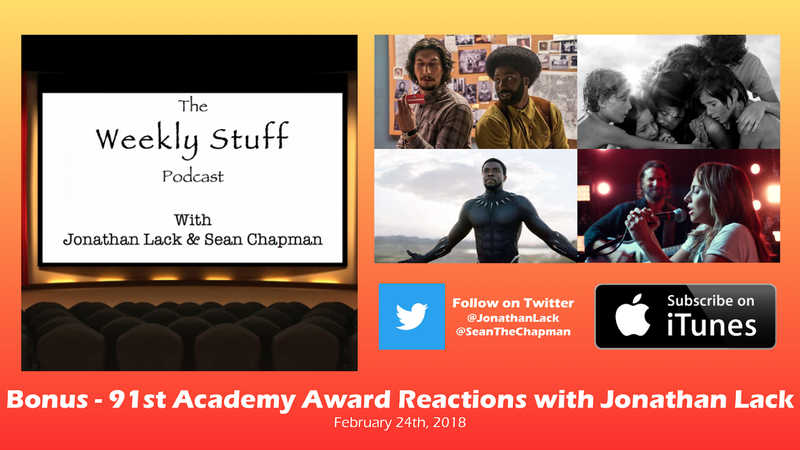 Sean couldn’t record this week, so instead, Jonathan watched and live-tweeted the 91stAcademy Awards, following it up with a solo podcast discussing overall reactions to the show, the winners, and what we should take away from a night that had a horrible ending – Green Book, aka 2 Driving 2 Daisy, winning Best Picture – but a lot of things worth celebrating along the way. 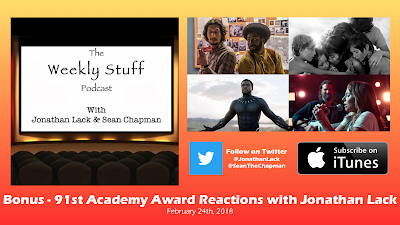 Jonathan delivers a monologue about the good and the bad of this year’s Oscars, and what lessons we might learn from them, before going category by category to discuss the winners, losers, and where his predictions diverted from the final results. 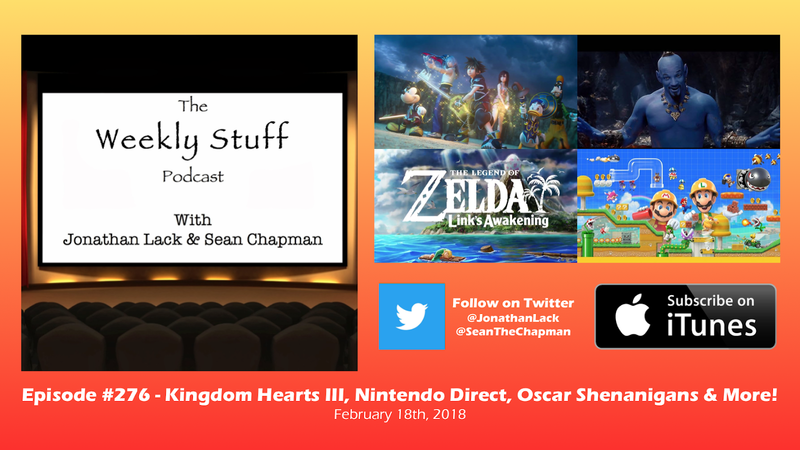 The Weekly Stuff Podcast #276 – Kingdom Hearts III, Nintendo Direct, Oscar Shenanigans, and more! This week saw Nintendo’s first Direct in months, featuring announcements ranging from Super Mario Maker 2to a Link’s Awakeningremake, plus more details on Fire Emblem: Three Housesand a cavalcade of surprise eShop releases. 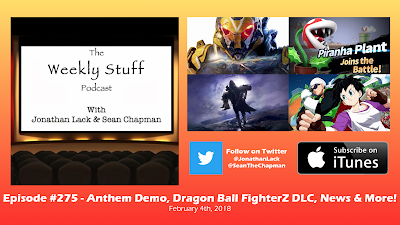 We talk about all of that and more, go over the latest in a seemingly endless stream of Academy Award dumpster fires, share our horror over Will Smith’s uncanny valley Genie in Aladdin, talk more Destiny 2, and Jonathan relates his experience buying Starlink: Battle for Atlas on the cheap. Then, we’re joined by special guest Thomas Lack, a lifelongKingdom Hearts fan, to tell us about his experience with Kingdom Hearts III, and whether the game lived up to its decade-plus of expectations. 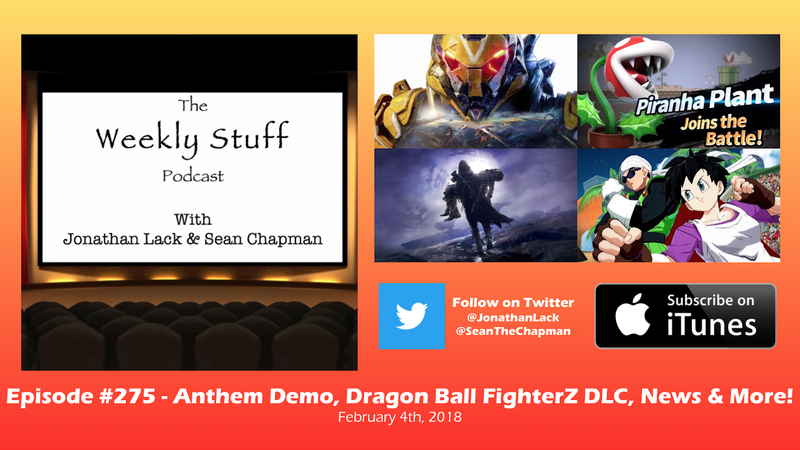 The Weekly Stuff Podcast #275 – Anthem Demo, Dragon Ball FighterZ DLC, News and more! This week, we got our first hands-on look at Bioware’s Anthem, and the results were…not pretty. We break down all the ways this uninspired Destiny clone has us worried after a few hours with the public demo, while also talking about Destiny itself and the Forsaken expansion we’ve both recently caught up with. We gush over the new combatants introduced to Dragon Ball FighterZ, Jiren and Videl, while expressing both excitement and horror about Piranha Plant’s debut in Super Smash Bros. Ultimate. A big chunk of news, including the latest moves out of DC’s film universe and some striking Nintendo sales data, rounds out the episode.